This article is about the section of Interstate 15 in Idaho. For the entire route, see Interstate 15. Interstate 15 (I-15) is a part of the Interstate Highway System that runs from San Diego, California, to Sweetgrass, Montana. In Idaho, the Interstate Highway runs exactly 196 miles (315 km) from the Utah state line near Woodruff north to the Montana state line at Monida Pass. I-15 is the primary north–south highway of Eastern Idaho. 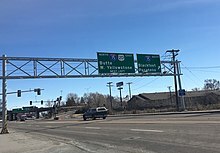 The Interstate Highway connects Pocatello and Idaho Falls, the fourth and fifth largest cities in Idaho, and the smaller county seats of Malad City, Blackfoot, and Dubois. I-15 connects all of those cities with Salt Lake City to the south and Butte to the north. The Interstate has business loops through McCammon, Inkom, Pocatello, Blackfoot, and Idaho Falls. I-15 is designated the Veterans Memorial Highway for its entire length in Idaho. I-15 enters Oneida County from Box Elder County, Utah, south of the hamlet of Woodruff. The four-lane Interstate heads north parallel to the Union Pacific Railroad's Malad Subdivision rail line, a road named Old Highway 191, and the Malad River along the eastern edge of the wide Malad Valley adjacent to the Malad Range. I-15 has a diamond interchange with Woodruff Road at Woodruff and follows the western edge of Caribou National Forest. The highway passes just to the east of the county seat, Malad City, where the highway has a diamond interchange with the eastern end of Idaho State Highway 38 (SH 38). I-15 continues along Deep Creek to another diamond interchange with the western end of SH 36. From there, the Interstate follows the narrow valley of Devil Creek between the Bannock Range to the east and Elkhorn Mountain to the west. I-15 has one more diamond interchange in Oneida County next to Devils Creek Reservoir before the highway reaches Malad Summit, where the highway leaves the Great Salt Lake watershed and enters the Snake River watershed. I-15 enters Bannock County and descends into the Marsh Valley, named for Marsh Creek, which the highway begins to parallel at its diamond interchange with SH 40, which heads east toward Downey. At a diamond interchange at the hamlet of Virginia, the Interstate begins to run concurrently with U.S. Route 91 (US 91) and parallel Union Pacific's Pocatello Subdivision rail line and Old Highway 91. I-15 and US 91 have diamond interchanges with Arimo Road just west of Arimo and with the southern end of I-15 Bus. south of McCammon. At the north end of McCammon, the Interstate reconnects with its business route and is joined by US 30. I-15 heads north through Indian Rocks State Park along a ridge between Marsh Creek to the west and the Portneuf River to the east, then crosses the Portneuf River just east of its confluence with Marsh Creek. I-15 crosses over the rail line and Old Highway 91 as it curves west to follow the narrow valley of the Portneuf River between the Bannock Range to the south and the Pocatello Range to the north. The highway has partial interchanges with I-15 Bus. on either side of the tiny city of Inkom. I-15 begins to curve north at its four-ramp partial cloverleaf interchange with Old Highway 91 at Portneuf shortly before entering the city of Pocatello. US 30 and US 91 split off from the Interstate at the next interchange, a diamond interchange with Fifth Avenue that marks the southern end of Pocatello's I-15 Bus. I-15 veers away from the rail line and the Portneuf River, has a diamond interchange with Clark Street east of downtown Pocatello, and collects the other end of I-15 Bus. at its diamond interchange with Pocatello Creek Road. The Interstate leaves the city of Pocatello at its directional T interchange with I-86. I-15 passes along the eastern edge of the city of Chubbuck, which is accessed using I-86. I-15 continues north onto the Snake River Plain and into the Fort Hall Indian Reservation. The highway accesses the reservation's main settlement, Fort Hall, via a diamond interchange with Ross Fork Road on the Bannock– Bingham county line. I-15 has a four-ramp partial cloverleaf interchange with US 91, at which the highway crosses over Union Pacific's Montana Subdivision rail line, near the northern edge of the reservation; I-15 Bus. splits northeast with US 91 from this interchange. The Interstate curves northeast and crosses the Blackfoot River and begins to parallel the Snake River as it passes along the western edge of the city of Blackfoot. I-15 Bus. reconnects with I-15 at a diamond interchange with US 26 (Bridge Street), which runs concurrently with the Interstate leaving Blackfoot. The highway crosses the Snake River at the northern edge of the city. I-15 has a partial cloverleaf interchange near Rose before it crosses a pair of irrigation canals. The Interstate then travels across the eastern part of the Hell's Half Acre Lava Field ahead of its interchange with River Road, which provides access to Shelley east of the Snake River. I-15 enters Bonneville County at its interchange with West 65th Street South near Woodville, which is simply given the destination of "Exit 113" northbound. US 26 and I-15 Bus. split off onto Sunnyside Road shortly before I-15 enters Idaho Falls. The Interstate has a five-ramp partial cloverleaf interchange with US 20 (Broadway Street), from which US 20 Bus. splits east concurrent with I-15 Bus., which returns to the mainline Interstate. I-15 and US 20 run concurrently to a four-ramp partial cloverleaf interchange where US 20 heads northeast as a freeway towards Ucon, Rigby, Rexburg, Sugar City, St. Anthony, Ashton, Island Park, West Yellowstone, and Yellowstone National Park. The Interstate heads north out of Idaho Falls parallel to the Montana Subdivision rail line, Old Highway 91, and the Snake River. I-15 enters Jefferson County just north of its diamond interchange with Osgood Road, and the freeway diverges from the Snake River at Roberts, where it has a diamond interchange with the western end of SH 48. I-15 passes Market Lake Wildlife Management Area ahead of its diamond interchange with SH 23 at Sage Junction. The highway has a diamond interchange with Hamer Road at Hamer and briefly passes through the Camas National Wildlife Refuge and crosses Camas Creek, which flows into Mud Lake. I-15 follows a tributary of Camas Creek, Beaver Creek, into Clark County and its county seat of Dubois, where the Interstate meets the eastern end of SH 22 at a diamond interchange. North of Dubois, the freeway has a partial cloverleaf interchange with Sheep Station Road that serves the U.S. Sheep Experiment Station. I-15 continues along Beaver Creek through a diamond interchange at Spencer as the Interstate enters the Bitterroot Range. The Interstate enters Targhee National Forest and has diamond interchanges with Stoddard Creek Road and at Humphrey. I-15 reaches its northern end in Idaho at Monida Pass, where the highway crosses the Continental Divide into Beaverhead County, Montana. 116.067 72 I-86 west – Chubbuck, Twin Falls I-86 exits 63A-B; tri-stack directional T interchange. I-15 has five Interstate business loops in McCammon, Inkom, and Pocatello in Bannock County, as well as in Blackfoot in central Bingham County and Idaho Falls in western Bonneville County. Some of these routes are overlapped by segments of US 91. ^ a b "Milepoint Log - State Highway System - I-15" (PDF). Idaho Transportation Department. October 23, 2014. Retrieved 2015-03-01. ^ "Arimo to McCammon Interstate Due to Open". Idaho State Journal. Pocatello, Idaho. October 3, 1965. p. 1. Retrieved July 15, 2018 – via Newspapers.com. ^ "Interstate 15 Opening Set For Wednesday". Idaho State Journal. Pocatello, Idaho. November 2, 1965. p. 7. Retrieved July 15, 2018 – via Newspapers.com. ^ "Ceremonies, Speeches Open Newest Stretch of Interstate". Idaho State Journal. Pocatello, Idaho. August 5, 1966. p. 2. Retrieved July 15, 2018 – via Newspapers.com.